C1581. ROGER DESORMIERE Cond. RTF S.O. 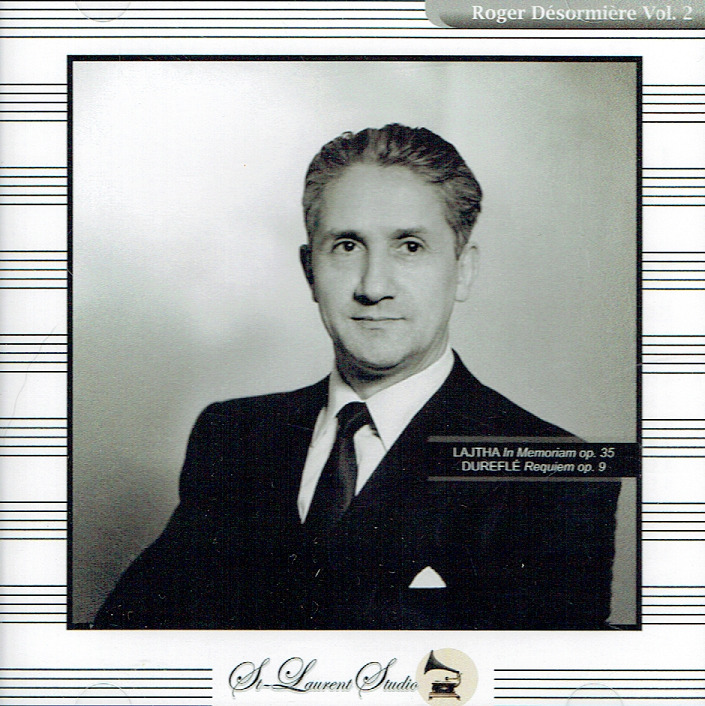 : In Memoriam (Laszlo Lajtha); w.Maurice Durufle (Organ), Camille Mauranne (Bar.) & Helene Bouvier (MS): REQUIEM (World Premiere Performance) (Maurice Durufle). (Canada) St Laurent Studio YSL T-593, Live Performance, 2 Nov., 1947. Transfers by Yves St Laurent. 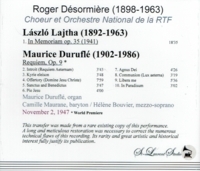 "Roger Desormiere's teachers were extremely distinguished: he studied flute with Philippe Gaubert, orchestration with Vincent d'Indy, fugue with Charles Koechlin, and harmony with Xavier Leroux. Desormiere then worked as a flautist in various Parisian orchestras before making his debut as a conductor with the Concerts Pleyel in 1921. From 1923 onwards he collaborated with the group of composers known as Les Six, and was himself a member of the Ecole d'Arcueil, which was founded by Erik Satie, Henri Sauguet, Maxime Jacob and Henri Clicquot-Pleyel. He conducted the first performances of ballets choreographed by Massine with music by Satie and Milhaud at the Soirees de Paris, and composed the music for Cocteau's abbreviated production of ROMEO AND JULIET. After a year as chief conductor with the Ballets Suedois, he took the same position with Diaghilev's Ballets Russes in 1925, staying with the company and touring widely until 1929. Among the composers who worked with the company and whose music Desormiere conducted were Stravinsky, Prokofiev and Poulenc. In 1936 Desormiere became chief conductor of the Paris Symphony Orchestra as well as permanent conductor at the OpÃ©ra-Comique, Paris; here he refreshed the repertoire with operas by Chabrier, Ravel and Richard Strauss, and in 1942 led a legendary production of Debussy's PELLEAS ET MELISANDE with Irene Joachim and Jacques Jansen. He had recorded the opera with the same principals earlier in 1941, and this performance has maintained a prominent place in the catalogue ever since, fully justifying its own legendary status. Between 1944 and 1946 he was the director of the OpÃ©ra-Comique, Paris, and during 1945-1946 he was also associate director of the Paris OpÃ©ra. 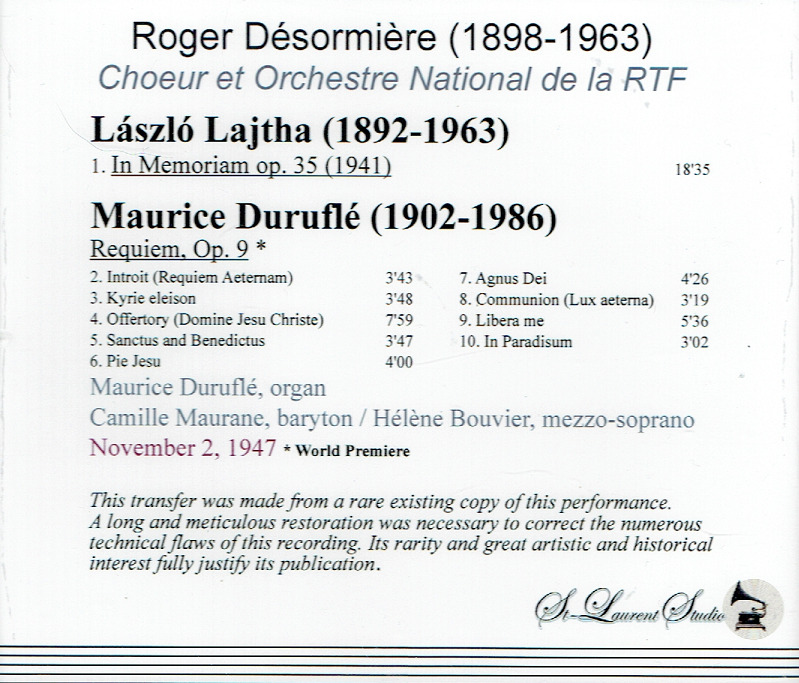 The importance of Desormiere to contemporary French music cannot be overestimated: he conducted the first performances of such notable works as THE PRODIGAL SON, by Prokofiev (1928), ACTION DE GRACE and TROIS PETITES LITURGIES DE LA PRESENCE DIVINE by Messiaen (1936 and 1945), the Organ Concerto of Poulenc (1939), the Symphony in Three Movements by Stravinsky (1946), LE SOLEIL DES EAUX by Pierre Boulez (1950), and Henri Dutilleux's Symphony #1 (1951). After his death many paid tribute to Desormiere's generosity of character and distinguished musicianship, perhaps none more eloquently than the composer Olivier Messiaen, who said, 'I shall never forget that, in my youth, he was truly the friend of composers, and the conductor'." "Although he was born in 1902 and died in 1986, Maurice Durufle is not a typical 20th-century musician....Within the very tight personal and musical orbit in which he worked, Durufle was a phenomenon. He composed a surprisingly small amount of music, working slowly and diligently with a focus on detail that required years of revision before a piece entered the public repertoire. He was recognized as the greatest organist of his day because he was a brilliant virtuoso player and because of his articles about and contributions to organ design. He was an outstanding teacher at the Paris Conservatory, with an unparalleled understanding of harmony and Gregorian chant, an ancient form that he helped restore to popularity. And of course his REQUIEM and a few organ works are unquestionable masterpieces, brilliantly cut and crafted gems that reach the heart with their purity and grace. Despite his withdrawn and difficult personality, Durufle was deeply loved by his wife and a few close friends. He is not the first composer who appeared to inhabit a world set apart from others, but in order to understand the man and his music, we need to consider what might have made this talented and creative person so estranged and alienated. Durufle also described his early schooling experience, which lasted into his adolescence, as one of imprisonment. He went from a warmly supportive home into the rigorous discipline of the choir school. Maurice found his only joy in the choir and soloist rehearsals, where he sang works by Bach, Mozart, Haydn, Beethoven, Faure, and other masters. It should not come as a surprise, then, that in all Durufle's life work as a church organist, he never trained a choir. As Durufle turned 27, he began studying orchestral conducting. His subsequent career at the Conservatory was stellar. Yet even while the world of music held him in high esteem, he remained reclusive and withdrawn." "Helene Bouvier was a French operatic mezzo-soprano, particularly associated with the French repertoire. She studied at the Paris Conservatory and made her debut in Nantes in the title role of Gluck's ORFEO ED EURIDICE, in 1930. She then left for Argentina where she sang at the Teatro Colon in Buenos Aires. Back in France, she made her debut at both the Palais Garnier and the Opéra-Comique during the 1938-39 season, where she quickly established herself in roles such as Carmen, Dalila, Charlotte, Genevieve, the mother in LOUISE, etc. She made guest appearances at La Scala in Milan, La Monnaie in Brussels, the Monte Carlo Opera, also appearing in Dresden and Leipzig, the Holland Festival, and again at the Teatro Colon from 1949 until 1965. She took part in the creation of contemporary works, notably Maurice Durufle's REQUIEM and Darius Milhaud's BOLIVAR. She was also admired in Arthur Honegger's ANTIGONE and Carl Orff's OEDIPUS REX. She retired from the stage in 1967 and taught in Paris."